This interesting surname is of Anglo-Saxon and Irish origin, and has two possible sources, the first being from a nickname for a swarthy person, from the Old English pre 7th Century "colig", dark, black, a derivative of "col", (char)coal. The second source is an Anglicized form of the Gaelic-Irish "Mac Cuille" or "Mac Giolla Chuille", of uncertain origin. This sept was from Connacht and there were many references to members of it in the 16th Century fiants, relating to Counties Roscommon, Galway and Clare. The first recordings (see below) is from the Anglo-Saxon source of the surname. The first recordings in Ireland was of one Elnor Coleye who married Richard Powel on June 5th 1620 at St. John the Evangelist, Dublin. 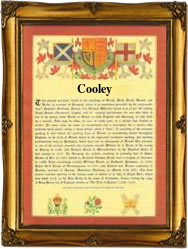 The modern surname can be found as Coley, Colley, Cooley, Cowley and Colly. Among the recordings in London are the christening of Abraham, son of Anthony and Ann Cooley, on July 4th 1695 at Christchurch, Greyfriars, Newgate. The first recorded spelling of the family name is shown to be that of Hugh Coly, which was dated 1212, The Curia Regis Rolls of Yorkshire, during the reign of King John, known as "Lackland", 1199 - 1216. Surnames became necessary when governments introduced personal taxation. In England this was known as Poll Tax. Throughout the centuries, surnames in every country have continued to "develop" often leading to astonishing variants of the original spelling.